I was thrilled when Laura Robinson asked me to take part in this special event at the North York Central Library as part of their Book Club’s reading of my favourite L.M. Montgomery novel, Rilla of Ingleside. 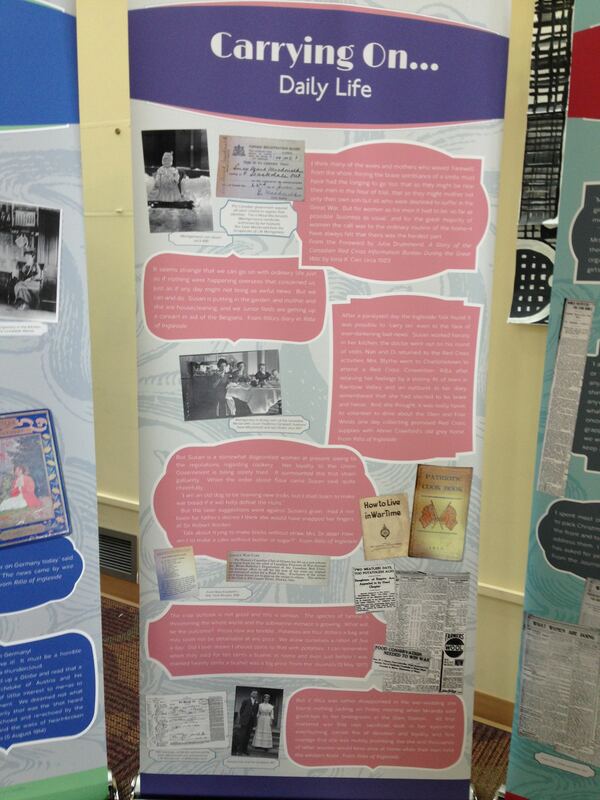 Laura has curated a thought provoking exhibit on L.M. Montgomery’s reflections on World War I, combining artifacts from the period, excerpts from Rilla and Montgomery’s journals. Here is the official flyer for Tuesday. Isn’t it pretty? 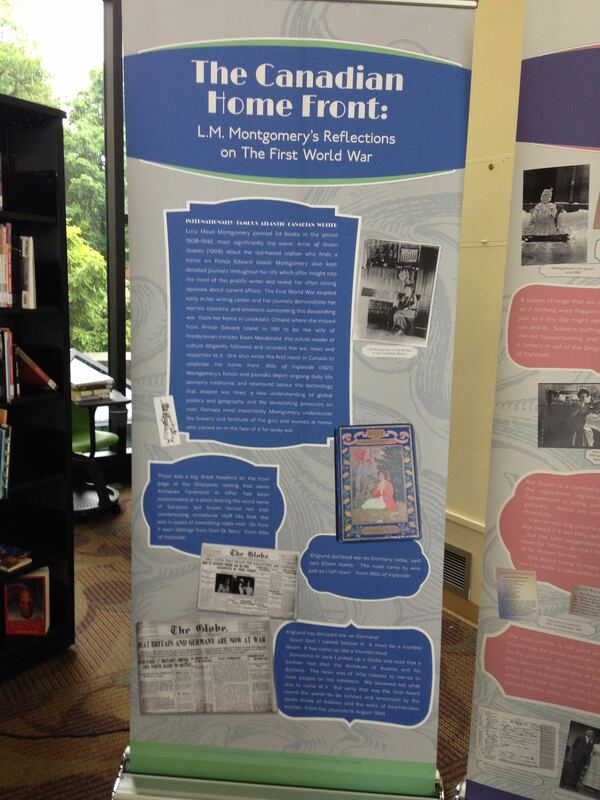 I had the pleasure of seeing Laura’s exhibit in Charlottetown when I was there for the conference last June. Here are a few pics to get you excited about coming. The first banner features I would say one of the first “selfies” taken in Montgomery’s kitchen in Leaskdale, Ontario. 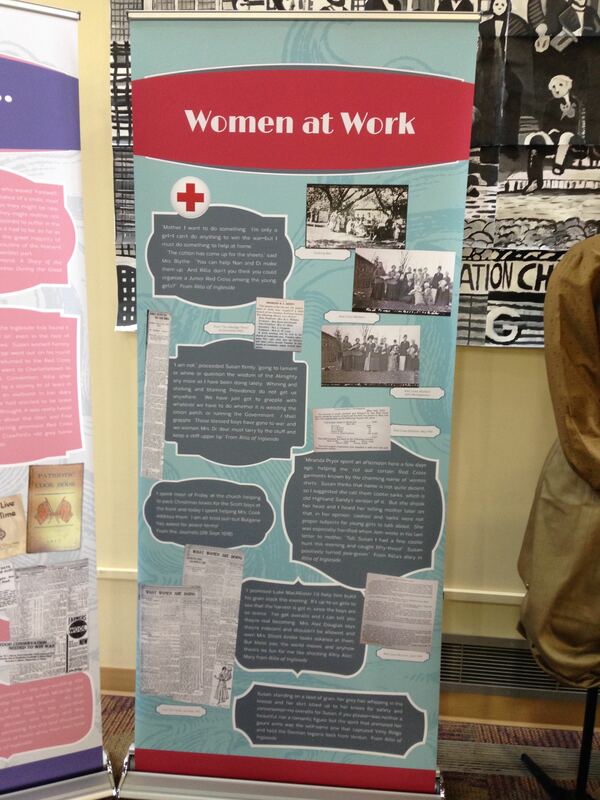 A big theme in Rilla is the idea of waiting and what women did for the war effort. Here are some of those reflections including telegrams, intimate photos of Montgomery’s life during the war, and some “how to” manuals on what people could do for the war effort. This exhibit highlights the important work women did for the war effort and how this was reflected in Rilla and Montgomery’s journals. There is certainly more to be seen, so if you’re free on Tuesday night and in the Toronto area, I hope to see you there. This entry was posted in Anne of Green Gables, Authors, Children's Literature, Inspiration, L.M. Montgomery, Talented Friends, Teen lit, Writing and tagged anne of avonlea, anne of green gables, anne of the island, Anne Shirley, Authors, Benjamin Lefebvre, canadian authors, Canadian Home Front, history, Inspiration, l.m. 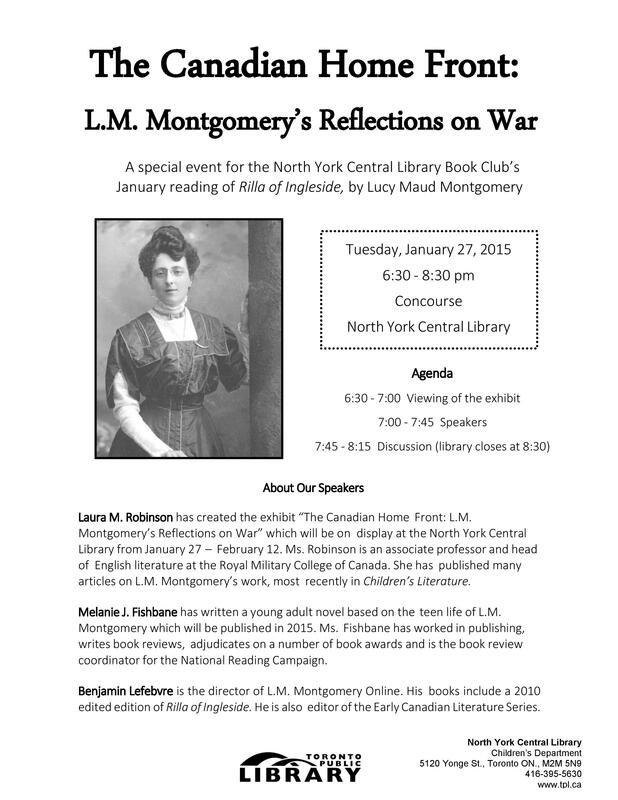 montgomery, Laura Robinson, Leaskdale, Lucy Maud Montgomery, Maud, Montgomery, Reflections on War, rilla of ingleside, Women in War, Women in Wartime Canada, World War I, Writing, WWI, WWI and Canada, WWI history, WWIhistory, YA fiction. Bookmark the permalink.